I find it intimidating to play a gig at which a large part of the audience is other musicians. My first thought whenever I'm in the room with other bands is to assume I'm probably the weakest bassist in the bunch. At that moment in time you are most likely the best prepared bassist to perform the given program. Your energy is better spent focusing on being a musician -- not just a bassist -- and making music. Always a plus when all you have to do is show up with your instrument. I went to a friend's wedding Saturday night. He's a buddy from high school and college, and he was in my first band (even though it didn't go anywhere). Beautiful ceremony, great reception. They had a band hired (regular corporate/wedding party music), but on their break, he got some of his old friends up to play. I sat in on a few songs, playing his Gibson G3Grabber bass, through the party band's old GK head & 4x10. IT was a lot of fun, and the old lead guitarist from that early band, whom I hadn't seen since then (20+ years) says we've got to get together and hang out & play again. Can you say, "reunion tour"? And to show how much of a small world it is, the drummer from the house band took a look at me and said, "You have to be a Lohrfink". Come to find out, he grew up in my neighborhood, and used to play with my uncle in bands back in the 70's & 80's. Two of the acts were singer/songwriters: chick with guitar. I missed the first one so no idea if she was any good. As I arrived, the BL told me everything was delayed - the band that was supposed to be playing, was waiting for their french fries to be served Rock'n'roll! When that band started, I decided to go have a listen and support them. Young kids, maybe 20 or so - the band is called "Burning Down The House". Bass player had an OLP with stickers, played through a kickback Hartke 10 or 12 inch speaker. GREAT tone, a bit dry but he played very tight. They mixed originals with covers - I totally loved their originals, they sounded familiar. The covers made me think they were playing originals They did "Brown Eyed Girl" so I cheered after the bass break Lead guitarist played a particularly tasteful solo during one of the originals. I'll be keeping an eye on them! By the time we took the stage, a lot of the people had left. I knew this would happen - the idea of "headlining" is always nice until you actually do it and see the whole room clearing ... Anyway, there were a good 30 or so people still in attendance, so we kicked it off with "Jailhouse Rock". This was our first gig with the new male singer (the new female singer couldn't make it so we "only" had 2 singers tonight). I had worked by the assumption that I would be DI'd - as usual - so I had brought my 65 watt Peavey amp the day before, and told the BL to take it (and my Squier bass) so he could sound check for me. As it turned out, sound check was canceled (glad I didn't show up early for THAT!) and I did NOT get a DI. So you can imagine my little practice amp farting out here and there. And still our sound guy (the BL's dad) kept motioning to me to turn it down - he likes his son's guitars up front and the bass buried. Tough luck, pops! Still, first gig where I had to play at 1 o'clock settings! But at 65watt, that is still very acceptable I guess On a side-note, I played my 4-string Squier Precision for the entirety of this gig - first time I ever used it exclusively for a gig, and the first time EVER that I played an entire gig on 4-string! All in all, it was probably one of our best gigs! No train wrecks, no real clams (aside from a few "jazz" moments). 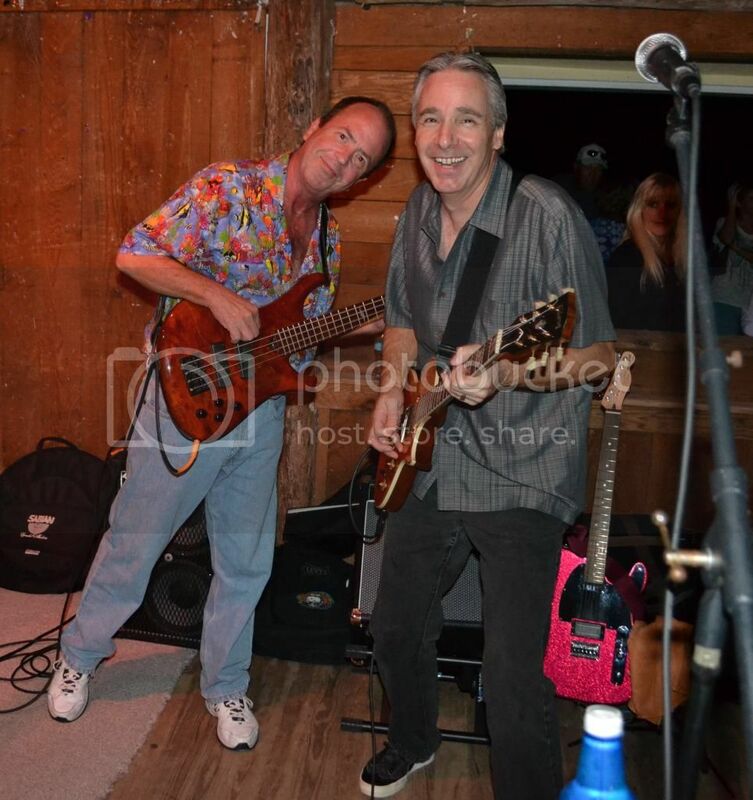 I sure had a boatload of fun - during "Black Horse And The Cherry Tree" I started dancing (only a few notes to play so I had ample time to do other things) and I assumed more than my share of rock poses throughout the gig - especially during "Go Your Own Way". It's been a while since I had so much fun during a gig! Really intense. 85 minutes straight, and I took very little time in between songs. My songs aren't...the easiest songs in the world to sing even when my voice is 100%, and it definitely wasn't 100% last night. Got through it quite well, though. I usually hate my shows right after I do them, and I didn't hate this one. Does that mean I sucked? Be careful, you might get used to this. So I had my first gig in almost 10 yrs playing bass, and first one ever on Acoustic bass, as well as ONLY bass (when I played before, I was also playing keys and had a lot of bass parts sequenced). Joined the band around a month ago and had 4 practices (3 with the drummer) leading up to the gig. The place had a good dinner crowd and we started with a couple hundred people. They stayed through the first couple sets, and the last one thinned out a little to maybe 75 people or so. I had a few flubs here and there, but probably no more than anybody else in the band. The bass player from my regular band was there and said I should play bass more often, so I felt pretty good about that. We got 2 more gigs booked there and for more money. 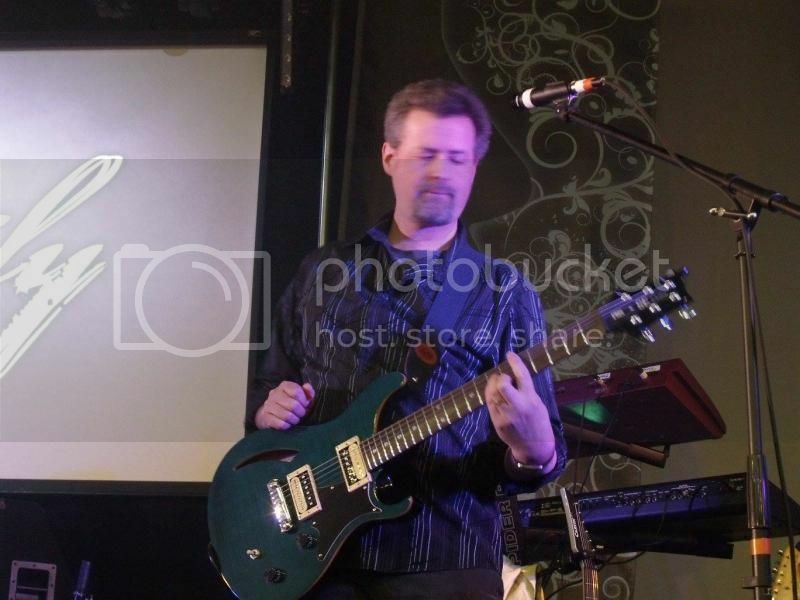 Oh, one other thing - first time playing live with the acoustic(AEB, not URB). We went IEM's so no amps or monitors on stage. However, I still had to really watch for feedback. Any A that I played in any octave wanted to ring. I had to always keep my A string muted. If I played an A it was OK as long as I was playing 1/8's or 1/4's - but if it sustained, it would start to ring. I could just fret it and use my right hand to dampen it so it didn't ring too much....a weird feeling to feel it vibrating on it's own even though I was holding it. Anyway, it added an extra level of difficulty to a few songs to be sure. Oh, and my fingers held up just fine. ...a little sore the next morning, but didn't bother me that night. Last night was my first gig in over 3 years. The last band I was in was playing up to 3 nights a week and sometimes with some serious travel involved, and (with a full time job) I got a little burned out and took a small break. Got a call from a guitarist I've worked with a lot, and he asked if I was interested in this job. 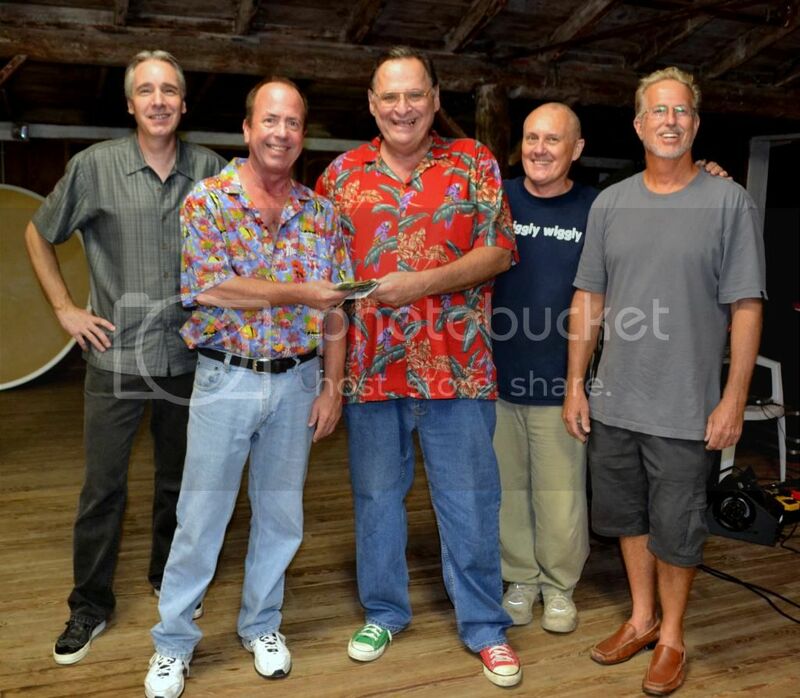 I've done over a hundred gigs with this particular group of guys over the last fifteen years, and I said yes. Got a copy of the set list - it was the same as the last time we were together; about 4 years ago. No real need for rehearsal, but we did get together one night just to make sure we were all on the same page. Mostly, it was a chance to have a brew and re-tell stories of gigs past. The 'hang' was always good with these guys. Funny; as often as we all talk about songs we love to hate (and every one of them was on the set list), time has a way limiting those feelings. Not fresh, but fun to play - most likely because of whom I was playing with. 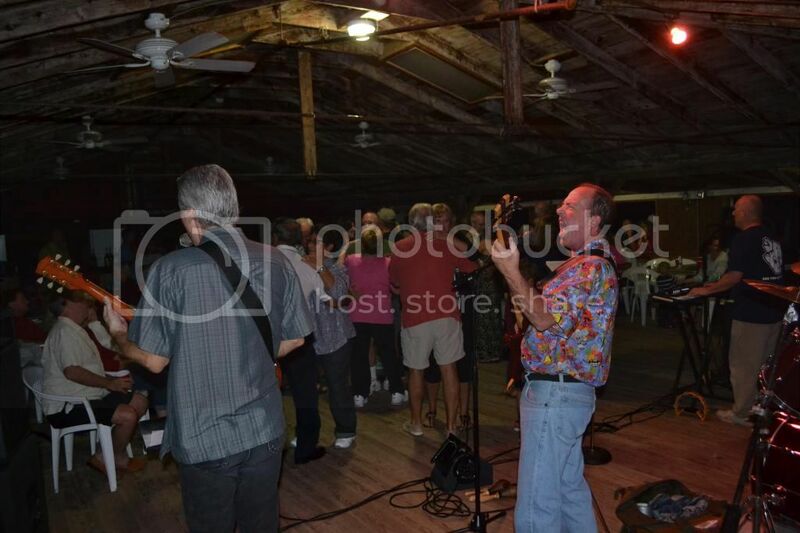 The gig was very informal - an annual private event where everyone knows everyone and we're all there to have some fun. Two long sets and one short one - we were done by 11:30 and I was home by midnight (3 miles from my home). The keyboardist told me of a project he's putting together and asked if I was interested, and I said yes. We'll see...Back In The Saddle Again?? Had a great solo gig this Thursday. I did 90 minutes on 12 string and it recorded fabulously well. (Didn't record the last 30 minutes since I hit the wrong button on the recorder) I only had, like, two bad vocal intonation events. Two brain farts on changes that I covered up for really well--on the tape, I could tell. But it just sounds like a different arrangement. Flat wound strings on the lower octave on the twelve string sounds great; rounder, fuller tone. Less zingy. Easier to play, and no string squeak. I hit all sorts of funky changes cleanly, like the Fm7b5/B that's in Supertramp's Logical Song. Rock on. I'm pleased. Will post some to soundcloud next week when I'm home from business. How 'bout Otis Redding's "Dock of the Bay" with a uke, and cajon and a double bass? Now, if I only knew how to upload a video. May God and Otis forgive us. Keep forgetting to post something here -- I played an enjoyable gig a couple Fridays ago. My blues band doesn't do the sleepy 1-4-5 stuff, it's more like Coco Montoya, Joe Bonamassa, Robert Cray, Tino Gonzales, Jonny Lang, along with a little funk. Everyone plays heads up ball, there is plenty of interaction, so we can comfortably stray from set arrangements. That's the way I love to play, freedom to have musical conversations, at least that's my favorite kind of gig. Unexpectedly small room and bar, we played there this summer on a big stage which they apparently don't heat in the winter. We left a lot of gear in the truck, and I took the less intense performance opportunity to play my fretless '98 Hoyt maple walnut fiver all night, instead of for just select songs. It's set up for sort of "regular bass" play, Thomastik Jazz Flats, no Jaco mwah, and it's so much fun to dance around the fingerboard without those bothersome metal bars getting in the way. It was a fun night, we were as tight as ever in spite of being off two months due to my NOLA sojourn. Looking forward to a more active 2015. Had a better-than-average show at the local biker bar where we're regulars every other Tuesday. During break I got to talking with one of the regulars. He said he was enjoying the show. A little while later the lead singer joined us. After a time the regular pulls out a photo of his daughter and explains that she passed away when she was in college as the result of a drunk driving accident on her way to see her boyfriend. Kind of an "out of left field" moment. The singer and I had no idea why he decided to share this with us. Turns out her middle name, Sarah, is the same as the lead singer's first name. His daughter's first name, Erica, is equivalent to mine. So there we are, Eric and Sarah, talking to this guy about his daughter Erica Sarah. The regular goes on to say that name of the guy she was going to see the night she died is Sean. The guitar player's name? Sean. That's a little too much coincidence for me. I think I'll make it a point to add his request, "I'm Free" (The Who), to our set list for the next show. Interesting gig last night. The snow started falling around noon and by about 3pm things were starting to shut down and the Township declared an "emergency." Our two horn players and our female vocalist were snowed in, but the remaining five of us (the original band--the horns and female lead are sort of permanent guests), were all local and committed to playing--we'd rehearsed too long and our next scheduled gig isn't until late May, so we really wanted this one. The venue said they planned to stay open regardless and it was up to us if we wanted to play. We said "the show must go on." Unfortunately, without horns or female singer, we had to drop about a third of our prepared tunes. Still that was good for two full sets, which the venue was happy for. When we started there were more staff than customers, but after a while a few more folks wandered in, and we actually had three or four people who were dancing throughout. I don't think the crowd ever topped 20 people. Our smallest audience ever, for sure. We finished our prepared stuff, and then pulled a couple of tunes out of the bag just from memory, and finished an hour earlier than usual. The bar was happy and still paid us--though at a slightly reduced rate. The bouncer came up to me and apologized for the poor attendance (like they had anything to do with it). We also managed to record our entire sets, and it actually worked out pretty well because there wasn't the usual overpowering crowd noise. Zombie thread resurrection! I was searching for some old gig reports to show a friend of mine, and came across this thread. Great fun re-reading some of those shows we all played! Anyone care to add some fresh material to it? I re-read the first few. Took me a few minutes to narrow down the time frame to what band my first post was, but now I remember the gig and the venue. Speaking of zombies, that place shut down shortly after that gig; but just re-opened last month! My "main" band that I've been rehearsing worth over the last 14 months is finally a solid line-up and ready to gig. Hopefully I'll have something to add here in the next month or so. A friend asked me to play a couple of shows with him and his wife next month, so there's always that. Three rehearsals, and we're pretty smooth. I haven't played bass in a band for a while - I think about 18 months or so, and haven't really picked up my bass much as I've been busy with keyboards. 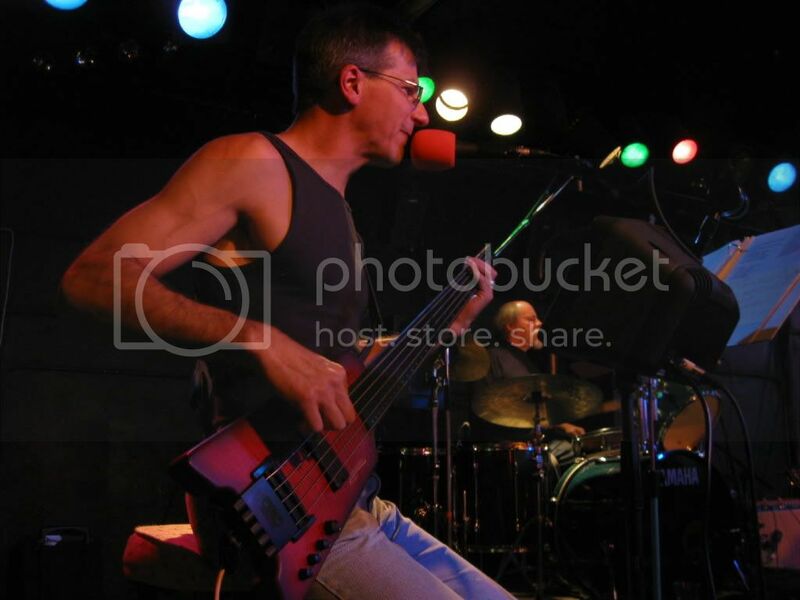 Anyway, one of my old bands needed somebody to fill in since their regular bass player had a conflict. This is a 5-pc acoustic band with the 2 guitar players switching between 6- and 12-string, mandolin, banjo, etc. They sent the setlist and I ran through set 1 Thursday night and sets 2 and 3 Saturday morning for the Saturday night gig. I played my Michael Kelly Electric-Acoustic. I was most worried about my fingers holding up, but they did just fine (a little sore the next day, but no blisters or anything). No major clams or anything except one song I started briefly in the wrong key and quickly adjusted. The band members were all very happy and I got "good job" from each of them individually as well as "it's like you never left". I had a couple folks come up after the show with compliments. One said "I love watching you play that bass" and another was a bass player who came up to compliment me, which was nice. So all in all I'd say I felt pretty good about it, plus it was fun to put the bass on again and do a different bunch of songs than I've been doing for a while now. I think there were about 7 people in the audience at my last gig. My fame precedes me. At least the band didn't outnumber the crowd, right? barely! Of course about 1/2 were my family. Played at a "free summer lunchtime concert series" event last Friday. At the local library. I've known the guitarist & his wife, and played shows & sessions with him in the past. he brought in another guitarist (mostly rhythm) and a drummer he knew. Classic rock (Boston, Pat Benatar, Neil Young, Triumph, etc.) and a couple more modern tunes (they asked me to sing "Meant To Live" by Switchfoot). This was supposed to be outside, but due to the threat of rain, moved it indoors. I brought my PA, and for inside, it was probably more than we needed. But we just ran vocals through it. Drummer had been practicing with his acoustic kit, but due to the possibility of being inside brought his electric kit (one of the better ones, I must admit). So at least that volume could be controlled. Overall, it went well. Sure, some minor mistakes; but nothing glaring. Except two endings that weren't what we practiced, but we communicated them well enough to end together. In November, we're doing another show together. More may come up; but it was my understanding this project was really just for these two shows. 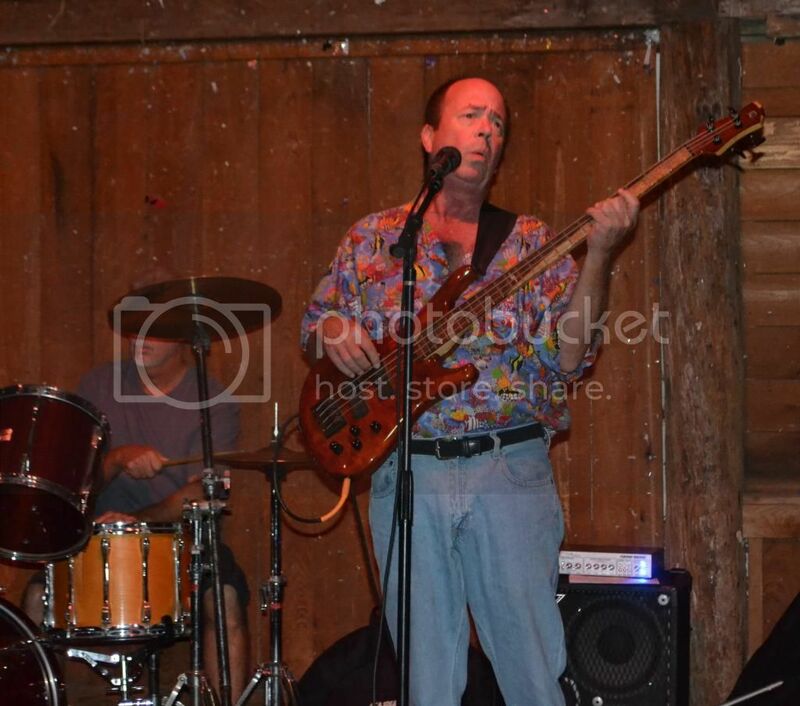 Now my "main" band has our debut booked at the end of the month at a county fair. Should be interesting. That's an outdoor gig with the lake behind us - there are docks and folks show up in their boats. Fortunately that also means women in their bikinis. Looks like a cool gig! We have one coming up in about 6 weeks. It's high time I got out there again! Well, last month we initiated 'Geezer Hours' at the gig we've been playing for the past 32 years. We've been playing 10pm-1am virtually forever but we've noticed that, since we've gotten older, our fans have as well. They know what causes that now. I've been hearing a lot of "it's just too late to come out at 10 to start our evening" and the band agrees. We used to be up there, tossing down shots with the dancers and jumping around - now it's large convenience-store coffee, extra strong. So, 'Geezer Hours'. Doors open at 8:30 and we go on at 9, playing till midnight. It worked relatively well last month (a trial run, so to speak). Tomorrow night is the real test - Friday of Labor Day weekend. We've put the word out among the normals - let's see if this gets them off the couch a bit more. I'll let you codgers know how it goes. It was really nice getting home before 3am last month. Some bars have started having the band's earlier and finish up the last hour before closing with a DJ since older crowds tend to be attracted to live music and younger crowds often prefer DJs. That's interesting - I hadn't heard that before, at least around here. Our soundman's son is a pretty awesome DJ - I might look into that. Thanks!